The view of Roanoke Sound from the front porch of the North Carolina Coastal Federation office in Wanchese. The office is hosting an open house June 26. Photo: Ashita Gona. 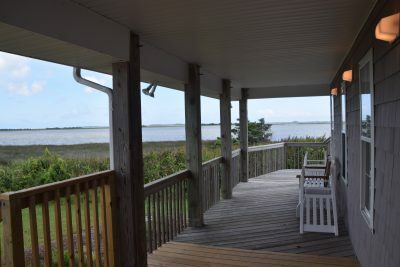 WANCHESE — Check out the new dock and grounds of the North Carolina Coastal Federation’s office here 5-6 p.m. Tuesday, June 26, during a community open house. 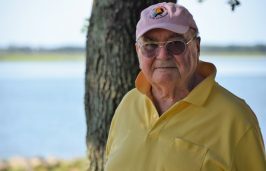 The event, which will feature light refreshments from Kelly’s Outer Banks Catering, will showcase the newly completed dock that provides waterfront access Broad Creek. This new addition offers a way for students to be involved in hands-on education programs and allows the federation to more easily create oyster habitat and restore wetlands in the area. Building the dock is the second phase of demonstration projects at the Wanchese office. Additional plans for the site include installing 500 feet of living shoreline along the property and building a demonstration oyster farm. The first phase included installing a rain garden, permeable pavement and a rain barrel to reduce stormwater runoff to Broad Creek and Roanoke Sound. “We are so thankful to our partners and supporters for making this dock a reality. It’s a tremendous asset that will help advance our local restoration and education programs,” Erin Fleckenstein, coastal scientist and regional manager for the Wanchese office, said in a statement. The dock is part of the federation’s regional programming efforts, according to the release. Recently, the federation partnered with volunteers and the North Carolina Roanoke Island Aquarium’s Green Team to build 100 feet of oyster sill to protect the shoreline. An additional 400 feet of shoreline will be protected with future work demonstrating a variety of shoreline protection materials. Camp Younts Foundation, Boeckman Family Foundation, Outer Banks Community Foundation, Inc., Stephenson Pope Babcock Foundation, Kelly Hospitality Group, Coastal Provisions Oyster Bar & Wine Bar Café and federation members supported the project. For more information, contact Sarah King at sarahk@nccoast.org.